So apparently the holistic doctors who were all being killed in FL had found out via their research that the nagalase enzyme protein is INTENTIONALLY being added to the population via immunizations. Nagalase STOPS vitamin D from binding to the Gc protein. This completely strips a human being’s body of it’s natural ability to kill cancer cells. Nagalase is a protein that’s also created by all cancer cells. This protein is also found in very high concentrations in autistic children. And they’re PUTTING it in our vaccines!! This prevents the body from utilizing the Vitamin D necessary to fight cancer and prevent autism. Nagalese disables the immune system. It’s also known to cause Type 2 Diabetes. So basically…they weren’t killing these doctors because they had found the cure to cancer or were successfully treating autism… they’re killing them because these Dr’s had been researching and had the evidence that the vaccines they’re injecting our precious children with are CAUSING our current cancer and autism crisis!! And that it’s obviously being done knowingly and on purpose! The Dr’s they killed in FL had been collaborating and were getting ready to go public with the information. 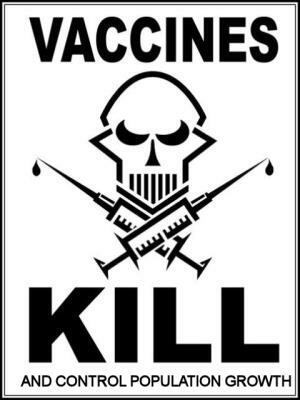 Depopulation 101..add poison to vaccines…make it law that all children must be injected to attend school. Slow kill methods. They think they’re being fair w/ their “survival of the fittest” type mentality. Only the best genes survive? These ppl have no souls. Dr Ted Broer breaks the above info (about the nagalese) in this clip. He explains it much better than I do. The clip is short (from his July 25th Hagmann & Hagmann interview) but it’s a MUST listen. Dr Ted Broer broke it on The Hagmann & Hagmann Report and it took them a whole hour just to get him on air b/c their 3 hour show was brought down and every line they tried to use kept disconnecting...and then their servers were brought down. They asked a bunch of ppl to pray against the attack and then finally got him on a secured line..and so a full hour into the show they were finally back on the air and connected to Dr Broer and the first thing he said was “I am in no way suicidal.” He was super nervous holding onto this info…afraid he’d be taken out Hastings style before he got a chance to say it publicly. So listen to this short clip of him breaking the story.